This precision piece of magic defies all possible logic! 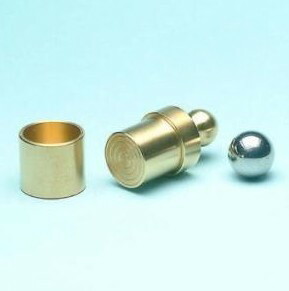 A beautifully-machined brass plunger, a brass cup and a steel ball make up what will be a thoroughly baffling piece of theatrical magic for you. Effect: The performer displays a solid brass plunger and a solid steel ball. The ball is dropped into a shallow brass cup (just large enough to hold the ball), which is resting atop the back of the performer's hand. The plunger is used to press the ball 'flat' into the cup...or so they think! The plunger is removed from the cup and the ball is seen to have vanished! But wait....it hasn't vanished....it suddenly drops from the performer's hand which it has apparently penetrated! This may read simple but the effect on your audience is staggering. Simply put, this is an impossible feat! This is a lovely piece of close-up conjuring that you will use often. Collectors have bought these for their beauty alone (not to mention their future collectable value!). Each outfit is hand polished and fitted for beauty and precision. Comes complete with brass plunger, cup, steel ball bearing and detailed instructions. Easy to do - self-working - and resets in seconds. This is one of the most visually impossible penetrations ever created. It may be done close-up and surrounded. And what's more, everything may be examined! I have only a couple of these, so have listed them in the "Used/Collectable" section, even though they are brand new. When they are sold, there will be NO more!